Home How Can We Help? What is a loan repayment calculator and how can I best use one? What is a loan repayment calculator and how can I best use one? Click here to go straight through to a loan repayment calculator or to learn more about loan repayment calculators read below. A loan repayment calculator is a handy tool, which provides you with an estimate of how much your loan repayments may be. A loan repayment calculator's results should only be taken as an approximation as the results will depend upon the variables you enter. The interest rate, for example may change over time. This will affect the loan repayment calculator result. Therefore loan repayment calculators are designed to be used as a guide only. Even so, a loan repayment calculator can be an effective tool because it can assist you to understand how a loan works; how much interest you may have to pay; the term of a loan and how that affects repayments. It may also help you decide what type of loan you think would best suits your needs. For example you may be looking at securing a new mortgage, or taking out mortgage refinance. You may want to look into a debt consolidation loan or a personal loan. Using a loan repayment calculator is rather simple. It doesn't take much effort. All you have to do on many of the simpler ones is type in your starting loan amount, the annual percentage rate and the term of your loan (5, 10, 20, 30 years, whichever is the case). Let's do an example. You want to buy a house and you already have the deposit saved. To purchase the property you need to borrow $250,000. Enter this amount in the loan calculator together with an interest rate e.g. 7.1% and the term of the loan, that is the time over which you want to repay the loan, for example 30 years. 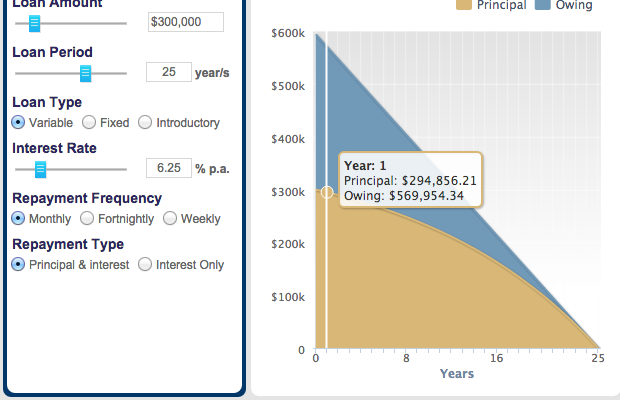 Then click the enter button on the loan repayment calculator. A loan repayment calculator is a great tool to allow you to compare different loans that may be available to you. Remember before you take out any loan you need to fully understand what you are doing and make sure the solution will be of real benefit to you.